Hope your week is off to a good start! I’ll be honest, as much as I tried to have a positive perspective today (see this instagram post) it has been pretty rocky. I left early to drop off someone at the airport this morning and seemed to be a little less prepared than usual. In fact, I grabbed the wrong medication (taken every day at noon) and a broken tripod. Then, I showed up where I was planning on eating breakfast only to find they had zero outlets (was also planning on working while I was there) and it was freezing. Now it’s after lunch and I’m finally pulling it together. A few deep breaths and now working from a Starbucks, I think all is back on track and well within the world. 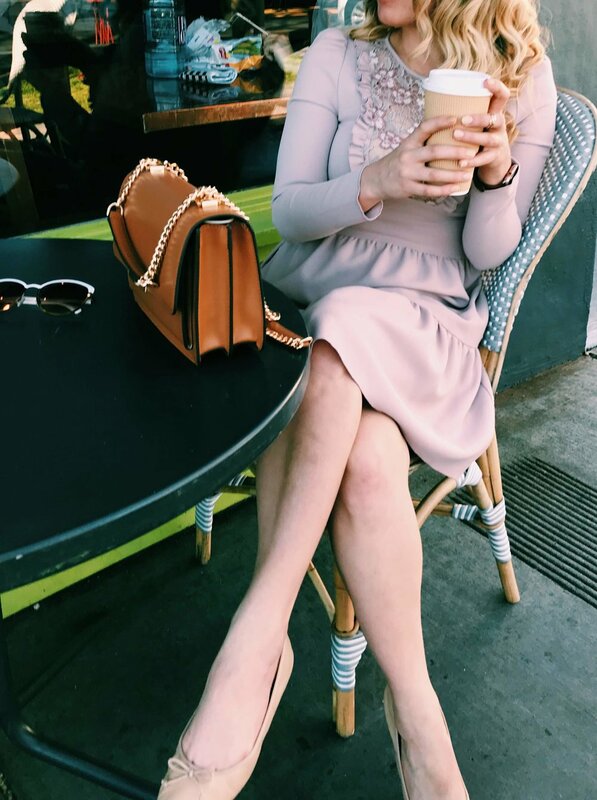 Funny how a little latte can solve so much! Today’s post was one I’ve been itching to share with you guys. While staying in Sacramento two weeks ago we split our time between an AirBnB and a hotel. The AirBnB was located in the city walking distance from this adorable cafe. As soon as I saw it’s flowered painted exterior I was hooked and had to drop in. 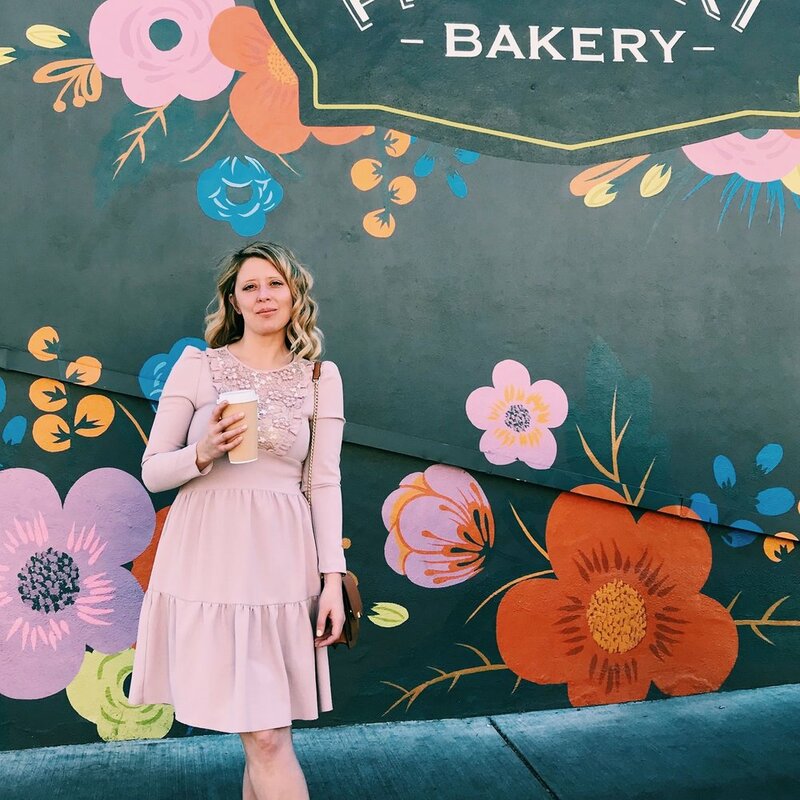 I am ALWAYS on the hunt for local coffee places and eateries when I travel. I seek them out for their ambiance, specialty drinks and food, and overall local service. Supporting small businesses keeps our American economy alive and flourishing. Local coffee shops or restaurants are a perfect place to find the best recommendations in the area. 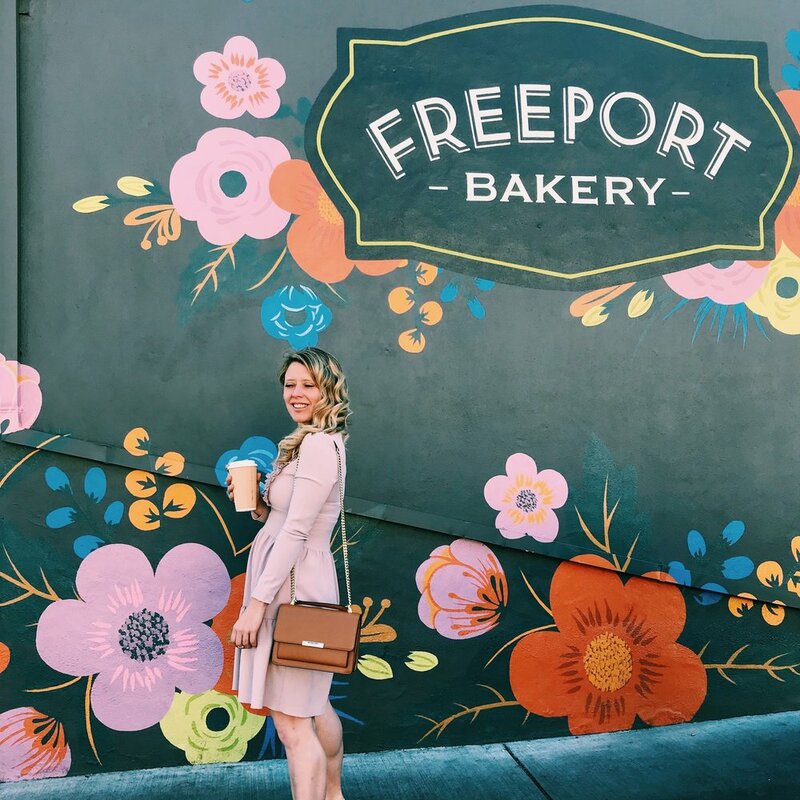 Yes, there’s so much planning you can do ahead of time when traveling but asking locals is the way to find the hidden gems such as the Freeport Bakery! 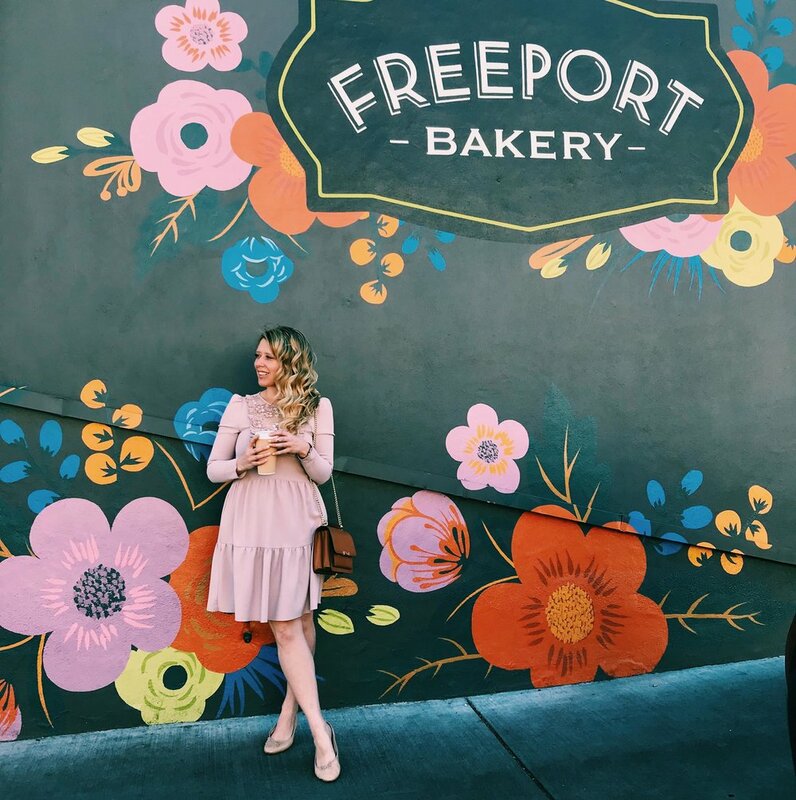 Freeport Bakery is not just a place for delicious coffee, it’s a full bakery complete with custom cakes, puffy pastries galore and all of the carbs you can inhale. The decor inside has the most beautiful floral wall paper in shades of coral and cantaloupe. Outside you will find a lovely patio perfect for a stop during the warmer months of Spring. 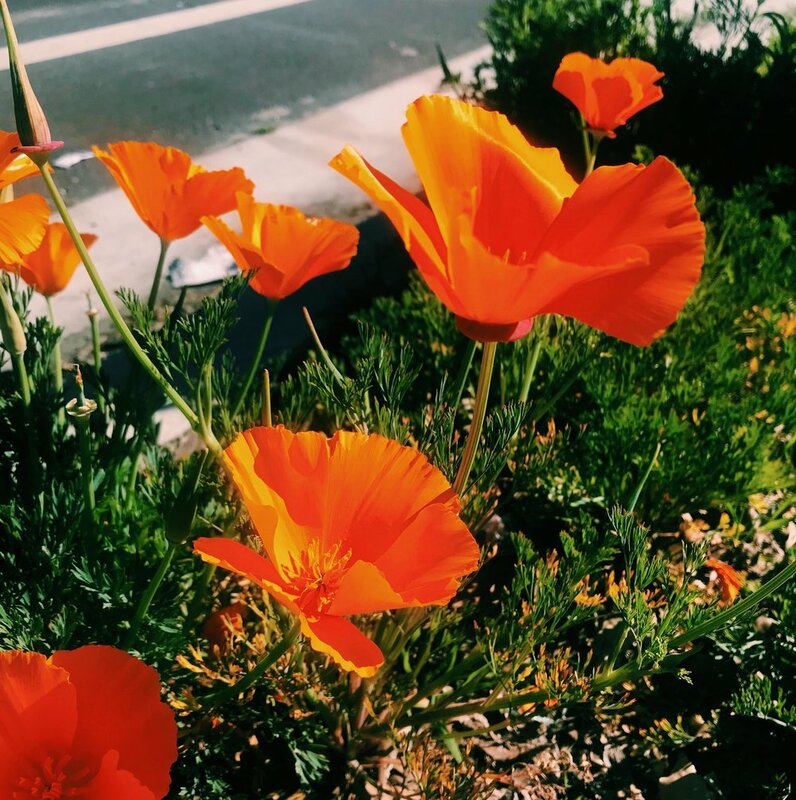 I mentioned last week just how beautiful Sacramento is during the spring! You can read more about the Capitol Park and rose garden here if you are stopping through this city. I really like visiting Sacramento. It’s not as busy and bustling as San Francisco but has a ton of historic sites with charming streets. For today'‘s look I wore a beautiful pale pink See by Chloe dress. 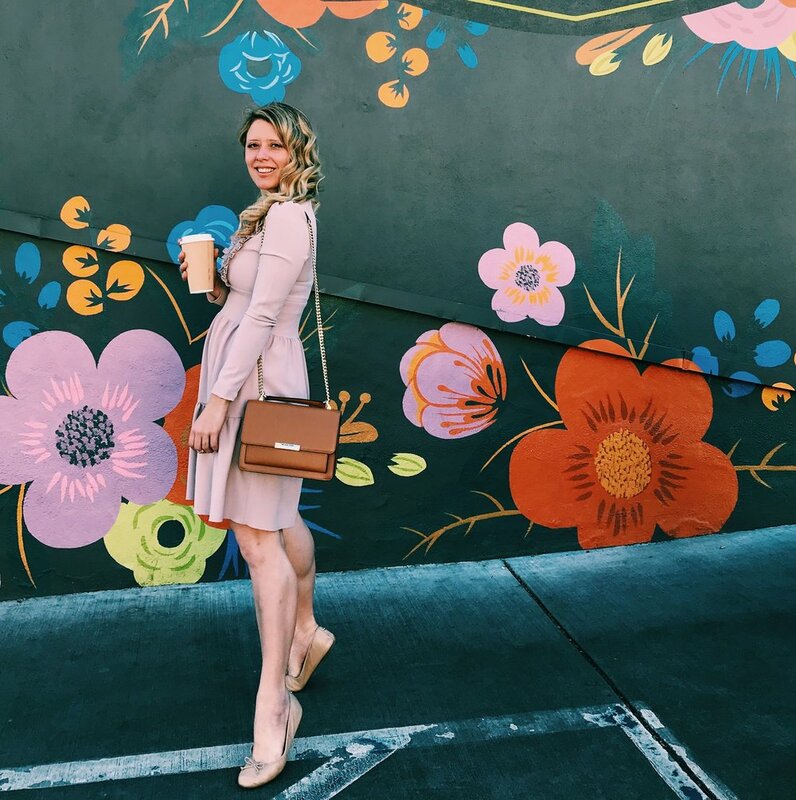 It’s such a perfect dress for Spring on chilly days. Bringing dresses on a trip offers so much versatility. You can layer cardigans, sweaters, blazers or jackets over them. You can dress them up with heels or down with boots or ballet flats. The embellished bodice is really beautiful and intricate for this dress! Unless you live underground, you probably notice the plethora of pearly accessories right now. (Especially hair clips or barrettes. More to come on this subject.) 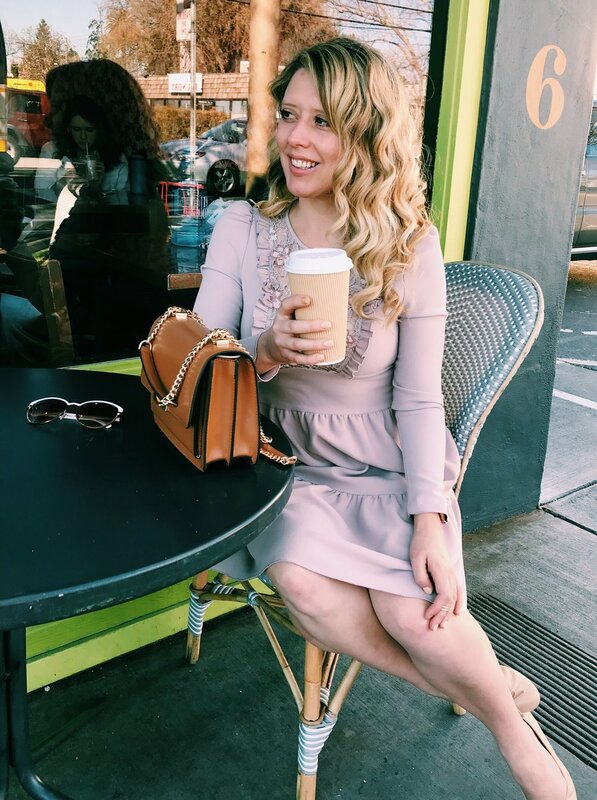 I rounded up several pink dresses for you to browse above including budget friendly options like this one for only $19 or this one for about $70. I’ve also recently added this pretty brown leather and gold chain strap bag to my collection. The color of leather is light enough to mix with black, brown, tan, navy or cream. The little bit of hardware dresses it up but the leather finish keeps the bag from looking over the top. It has almost a vintage feel and is a great size for carrying the essentials to dinner in the evenings. I’ll be sharing 1-2 more posts about Sacramento and am returning to the city over the Summer. If you are a California gent or gal, please send me your recommendations for future parks, sights, coffee shops and restaurants. This has been my fourth trip to the city and I’m looking forward to returning! 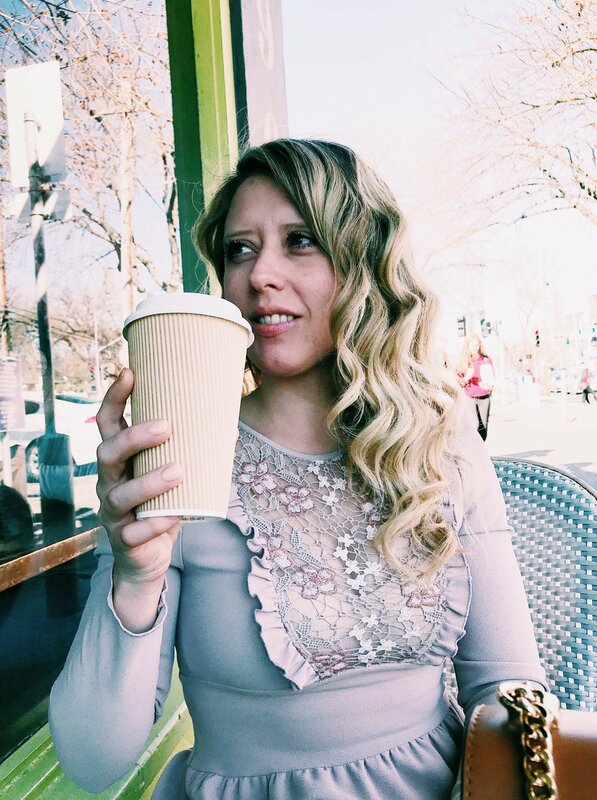 What are some of your favorite places to grab coffee?